Vic Morgan: Away the lads..
Two away games with differing fortunes this week. After a promising start to the new campaign, it was a slightly different feeling in the last few days. I, like a few others, was quite confident going to Chesterfield on Saturday. Sadly that confidence was, to say the least, unfounded. It was obvious that the penalty shoot out defeat at QPR had taken it’s toll on the Town and the Spireites were happy to take advantage. Former Swindon boss Danny Wilson had clearly sent his side out to attack from the off and it was a tactic that worked against tired legs. An injury to striker Luke Norris didn’t help and a controversial penalty decision going the way of the home side showed it wasn’t to be the Town’s day. A late debut goal from the promising Darnell Furlong gave Swindon some reward but in truth it was a fair result and with another tough away trip to come on Tuesday, the mood wasn’t great on the supporters bus on the way home. It seemed only moments after leaving the town of the twisted spire, that we were back on the road and on the way to Gillingham. 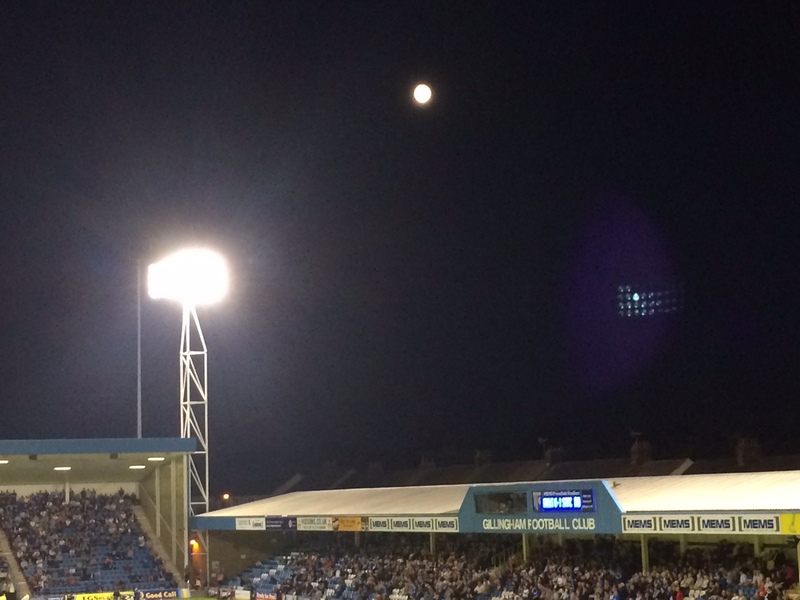 There was much discussion on the shape of the squad that would appear at the Priestfield Stadium. Would the lack of forwards be a factor in the way the team would line up? Well, yes it would because there would be no recognised striker in the side. It meant a bit of a lop sided look to things but it worked. Okay the home side had the better of the early exchanges but Swindon looked comfortable. Watched by his father Paul, Furlong again looked good and got my man of the match vote. He was instrumental in Swindon going in front as he was brought down and Michael Doughty stuck away the penalty. A nervy time then for the Town fans on the open, temporary, (it’s been there for years) away stand on a chilly Kent evening. After a Gills equaliser, the balance tipped in the home team’s favour. However, despite nine minutes of stoppages, Gillingham couldn’t get the winner and Swindon came away with a deserved point. The lack of a striker was obviously something that worried the Swindon management and it’s been rectified by the signing of Nathan Delfouneso. The former Villa man will be at the County Ground for the remainder of the season. A former England under-21 international, he obviously has quite a pedigree. I hope the move works out well for him. It’s early days of course, but there’s no doubt one or two players are catching the eye. Jordan Stewart, James Brophy and the aforementioned Furlong have done well with several others also showing up well especial goalkeeper Lawrence Vigouroux. It’s back at home on Saturday thank goodness and the visit of Port Vale. A win would be great to back up the opening day victory over Coventry. Here’s hoping.